On Jun.28, 2016, the signing ceremony of cooperative development of FenYi solar farm for targeted poverty alleviation was held by CEC GreatWall Energy (Shenzhen) Co. Ltd and Jiangxi FenYi Government. Solemn and simple, the ceremony attendees included representatives of Fenyi Government, County Government office, Development and Reform Bureau, County Poverty Alleviation and Immigration Bureau, County Construction Bureau, County Finance Bureau, Fenyi Investment Office, CEC Greatwall, Fenyi Branch of CEC Greatwall & etc. Junqing OuYang, the Chairman of Fenyi City Construction and Investment Co., Ltd, and Dexin Deng, vice president of CEC Greatwall Energy and CEO of Jiangxi Fenyi CEC Greatwall Electricity Co., Ltd, representing each party signed the first phase project cooperation agreement--Fenyi 3.3MW solar farm. Fenyi solar farm installed capacity is 3.37156MW. The project was approved in April, 2015. Construction began in July and successfully commissioned by end of December. The solar farm has been operating in stable condition with excellent power generation. Total power generation had reached 2,300,000KWH by Sept 12, 2016. Fenyi Government had provided great support to this project. After grid connection, Country Poverty Alleviation and Immigration Bureau representing Fenyi Government propose to list the project in country targeted poverty alleviation projects. After several communications, discussions, acceptance and assessment procedures, both parties eventually reached cooperation agreement to formally list it in country targeted poverty alleviation projects. In the future, both parties will continue to cooperate to develop more solar farms for targeted poverty alleviation projects under this cooperation mode using Fenyi rich resource of rooftop space and CEC Greatwall’s technical advantages. Under this cooperation mode, CEC Greatwall provides power plant construction and technical support services and the local poverty alleviation office operates the power plant, allowing the poor get long-term benefits. 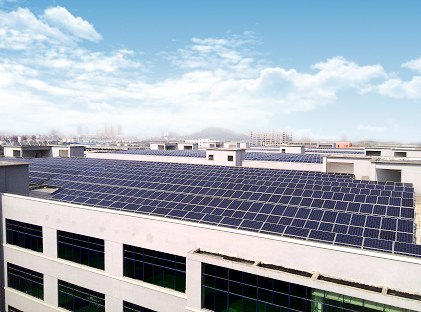 Through the cooperation, CEC Greatwall set up the solar project development mode for targeted poverty alleviation, providing successful experience and favorable conditions for the company’s subsequent power plant development. The leaders of both parties wish to spread the cooperation mode to whole JiangXi province.